Amongst the many packages that make up the CentOS 6 operating system is the Apache web server. In fact the scalability and resilience of CentOS 6 makes it an ideal platform for hosting even the most heavily trafficked web sites. 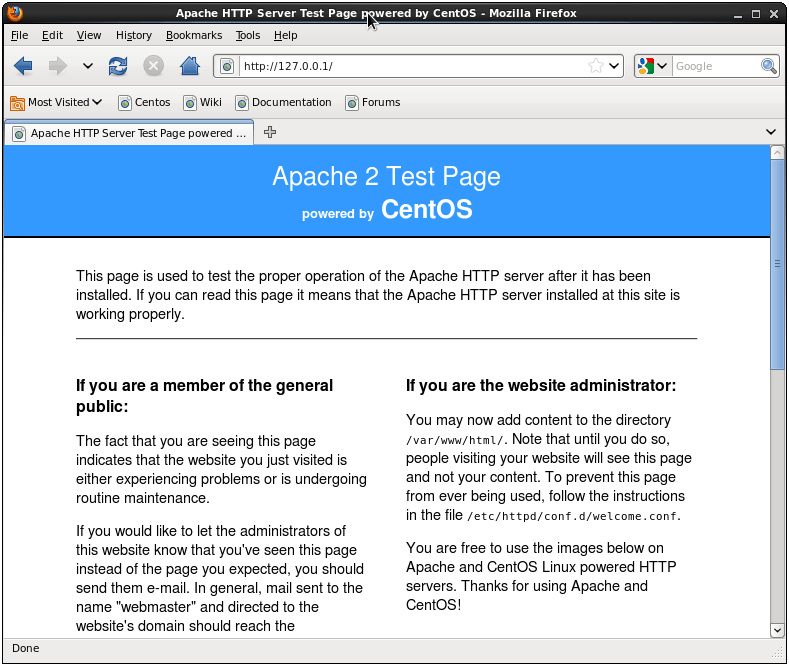 In this chapter we will explain how to configure a CentOS 6 system using Apache to act as a web server. To set up your own web site you need a computer, an operating system, a web server, a domain name, a name server and an IP address. The computer can be any system capable of running Linux. In terms of an operating system, we will, of course, assume you are using CentOS 6. As previously mentioned CentOS supports the Apache web server which can easily be installed once the operating system is up and running. A domain name can be registered with any domain name registration service. If your ISP provides static IP addresses then you will need to associate your domain with your static IP address. This is achieved using a name server. Most domain registration services will provide this service for you. If you do not have a static IP address (i.e. your ISP provides you with a dynamic address which changes frequently) then you can use one of a number of free services which map your dynamic IP address to your domain name. One such service is provided by http://www.dnsExit.com. Once you have your domain name and your name server configured the next step is install and configure your web server. Alternatively, if rpm generates a “package httpd is not installed” message then the next step, obviously, is to install it. This can be performed either from the command-line or using the Add/Remove Software tool. To use this tool, open the System -> Administration desktop menu and select Add/Remove Software. Enter your root password if prompted to do so. Select the Search tab and search for httpd. After the search completes the Apache HTTP Server should be listed in the search results. Click on the toggle next to the httpd server. Finally, click on the Apply button to begin the installation. Once the Apache server is installed, the next step is to verify that the server is running and, if it is not yet running, to start it. For more information on runlevels refer to the chapter entitled Configuring CentOS 6 Runlevels and Services. To configure the Apache service using the Service Configuration tool, select the System -> Administration -> Services menu option and scroll down the list of services until you find httpd. Select the item in the list and click on the Start button. Congratulations, you have now installed the web server and served up what will hopefully be the first of many web pages. The next step in setting up your web server is to configure it for your domain name. This is performed in the /etc/httpd directory. To configure the web server open a terminal window and change directory to /etc/httpd. In this directory you will find a number of sub-directories. Change directory into the conf sub-directory where you will find an httpd.conf file which contains the configuration settings for the Apache server. Edit the httpd.conf’ file using your favorite editor using the su command to ensure you have write permission to the file. Once loaded, there are a number of settings that need to be changed to match your environment. If your CentOS 6 system is configured to use a firewall, you will need to ensure that HTTP traffic on port 80 is permitted in order for external systems to be able to access your web server. Refer to Basic CentOS 6 Firewall Configuration for details on configuring a CentOS Firewall. If the CentOS 6 system hosting your web server sits on a network protected by a firewall (either another computer running a firewall, or a router or wireless base station containing built in firewall protection) you will need to configure the firewall to forward port 80 to your web server system. The mechanism for performing this differs between firewalls and devices so check your documentation to find out how to configure port forwarding. Once everything is configured it should be possible to enter the domain name of your web site into a browser anywhere in the world and access your web server. This entry was posted on May 2, 2012, 4:09 am and is filed under centos, Server. You can follow any responses to this entry through RSS 2.0. Both comments and pings are currently closed.